Preheat oven to 350° F. Grease a 9 inches donut-shaped pan with baking spray. To make the caramel add the sugar and water in a small pot at medium to low heat. Stir constantly until it turns golden brown. Pour the caramel into the pan and carefully spread the bottom and sides. Let cool. In a blender, mix all of the ingredients for the flan and strain the mix to make sure there are not leftover pieces of corn or lumps. Reserve. Using a mixer, beat the butter and sugar at high speed, until it turns light yellow, for about 5 to 8 minutes. Add the 4 egg yolks one by one until they are well incorporated. Continue to mix. Lower the speed and start adding the strained flour, alternating with the coconut milk. Beat until the mix has an even consistency, for approximately 5 minutes. In another medium bowl, beat the 4 egg whites at high speed until stiff peaks. Incorporate the egg whites little by little with the help of a spatula. Do not mix too much, just until all is well integrated. In the pan you have already prepared, add the mix of the cake and then the flan; you'll see how the mixes will exchange places while baking. Take it to the oven in a double boiler and bake at 350° F for an hour. To verify if it's ready, introduce a knife or a wooden stik in the center, if it comes out clean it means it's ready. Let cool on top of a wire grille. Remove from the pan while it is still warm. Then, take it to the fridge. Decorate with grated coconut or fruits, if you wish. You can use any pre-made cake mix in the market. Use your imagination and create delicious combinations. For the flan, you can use tender corn, cooked. Remember to strain it before pouring in the pan, or if you prefer, you can make it with vanilla or coconut. This combination of cake and flan is very easy to prepare, even though the first time I made it I also thought it was not going to come out well. 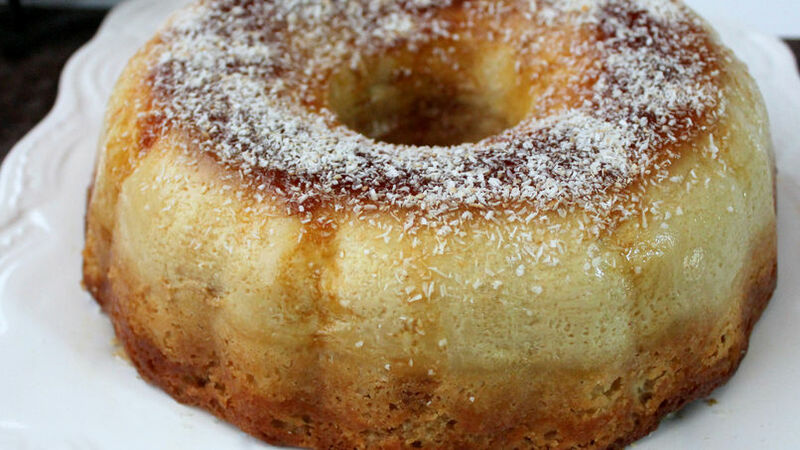 I recommend you use a pan with a donut shape, with the hole in the center, like a rosca, however if you don't have one, you may use a deep pan, appropriate for flan.